Have the greatest possible certainty that our features are working fine. We wanted to make the deployment pipeline as fast as possible. 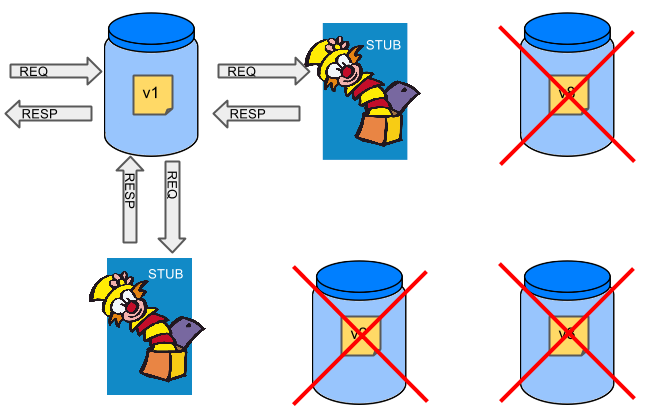 It was crucial to add the possibility to automatically rollback if something goes wrong. It is crucial that if you're starting with microservices you start introducing standards. Standards of running applications, configuring them (externalized properties) but also you should enforce standards in how you deploy your applications. At some point in time we have seen that different applications do common tasks in different ways. Why should we bother - we have business value to deliver and not waste time on enforcing standards - your manager might say. Actually he is really wrong because you're wasting plenty of time (thus money) on supporting such nonstandard applications. Imagine how much it needs for the new developers to understand how exactly the rules are set in this particular process. If you have two monolithic applications talking to each other and not too many developers working on the codebases you can queue deployment of both apps and always perform end to end tests. Who will pay the bills (imagine 100 microservices - each having each own environment). If I test against production versions then I'll never be able to test against a feature under development anytime before deployment to production. Due to technical issues, difficulties to maintain the spawned environments we've decided to simplify the pipeline as much as possible. That's why since we are enthusiasts of TDD and we know what Consumer Driven Contract is we've decided not to do End to End tests. We're deploying our application to a virtual machine where the executed tests don't interfere with other pipelines executed in the very same time. The argument that we don't know if a functionality is working properly made us invest more time and effort in tools that will give us more information on how our applications work on production. That's why we've added plenty of monitoring both technical and business via Graphite. Also we've introduced Seyren as the alerting mechanism to ping us immediately when something is really wrong on production. Whatever time you spend on improving your tests, testing environments or UATs with endless hours of clicking - it will never signify that on production your application will run in the same manner. Our decisions were related to trade offs. We decided to give away the complexity in the artificial test environments. That complexity was pushed to the monitoring of production instances. With microservices there is never an easy decision - there's always some price needed to pay. Finally what is published to Nexus is the fat-jar of the application together with its stubs. We deploy our freshly built application to the staging environment. Micro Infra Spring Stub-runner is responsible for downloading the current development versions of stubs of declared dependencies of the microservice. In the first version of the pipeline we've decided to go towards development versions since we would like each of the applications to go live after each commit. 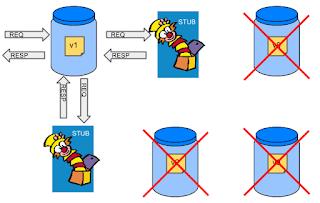 That means that there is a high probability that the development version of a stub is in fact the production one. Of course that not necessarily needs to be true - but this is our trade off. In the future versions of the pipeline we would like to test the app against both development and production versions of stubs. What is very important to see is that in this step we are upgrading the microservice's DB schema. We don't want to rollback the database. If you have MongoDB like databases there is no schema in fact. 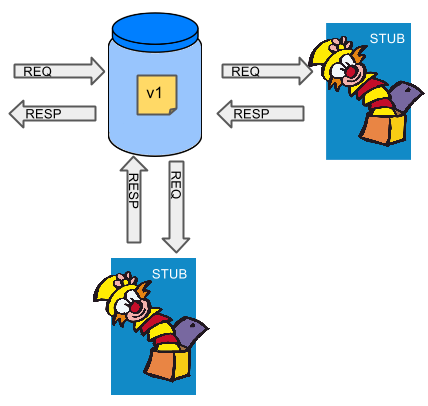 If you have Liquibase - you can provide the rollback scripts for relational DBs. They however introduce complexity on the DB level. We've decided to go with a trade off that the complexity goes out from the DB level to the code. We're not rolling back the DB but we're rolling back the application. That means that the developers need to write their code to support backwards compatibility. 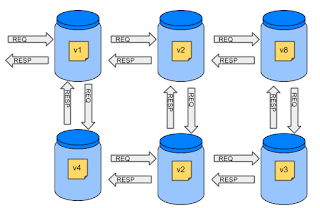 That means that the NEW version of the application MUST support the OLD schema of the database. Also developers MUST NOT do backwards incompatible changes in subsequent liquibase scripts. We're running old smoke tests on the rolled back version of the application that is connected to the new version of the schema. That way we can ensure that most probably we will be able to rollback on production without greater issues. If the smoke tests have passed and we've checked the rollback procedures we can go live. Here the monitoring part comes in. We need to ensure that we've put all the KPI checking alerts in place. As a part of deployment procedure a review of monitoring and alerts needs to take place. As you can see in the picture the first scenario of live deployment doesn't include 0 downtime approach. That was yet another trade off that we've decided to take. We don't want to tackle the issue of automatic data migration right now. Also for the developers writing code that supports both old and new schema is actually mind blowing. That's why we want to do things a step at a time - for now we kill all the application instances on production, boot one up and change the schema and then boot the rest up too. If our KPI monitoring starts to go all red on production then we need to rollback as fast as possible. Since we've tested the rollback procedure it shouldn't be an issue on production to kill all the instances, download the previous version of the app and run it against the new schema. As everything related to distributed systems - you can see that microservice deployment is not easy. Actually it's full of trade offs and complexity. 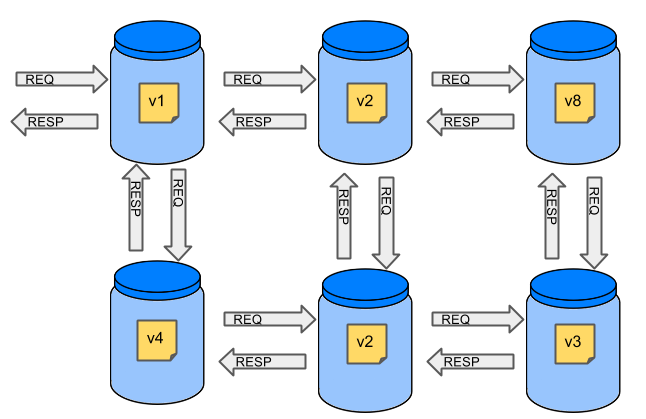 Starting from the infrastructure going through testing and finishing with database schema changes. The presented solution seems to be an acceptable compromise between time, effort, certainty and feedback.